…the number of homes that currently have no television licence, but that do have broadband subscription is currently estimated to be infinitesimally small. BBC technology chief Erik Huggers said: ‘My view is that if you are using the iPlayer you have to be a television licence fee payer. A fairly reasonable position in my view. In the changing world of television and news production and consumption we rely increasingly on services like the BBC to produce high-quality content; the commercial models are increasingly failing. 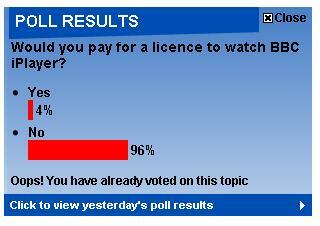 In fact I would personally go further, arguing for an increase in the licence fee. If Huggers was suggesting any of these changes the Daily Mail failed to include the appropriate quotes. It would be equally meaningful to say possible changes could include “Hanging for watching iPlayer without TV licence”; possible, but highly unlikely. The second suggestion “Increasing the cost of the current TV licence to include the iPlayer” is particularly stupid as the current TV licence already includes the cost of the iPlayer! Virtually all of the content of this course is so basic it can be self taught…In fact most people know all this stuff already. I think it’s a complete waste of university resources. Being able to use blogs, social networks, twitter, wikis, podcasts etc, is obviously not the same as understanding the role they play in society, but acknowledging that would have got in the way of a ‘good’ story. Obviously it is only a good story for the ‘gone to hell in a handcart’ brigade, but those are idiots who read the Daily Mail and the Daily Telegraph. What always amazes me about the Daily Mail is that the readers are actually worse than the journalists! Why do they think they are profound and witty when the comments merely express their own ignorance? Sometimes I join them in believing the world has gone to hell in a handcart, but that is due to my despairing at the ignorance of so many at a time of so much opportunity. This is for humans with an IQ of less than 20 ?? I choose to believe he is referring to placing comments on the Daily Mail site rather than the MA course. Obviously the Daily Mail didn’t link to the video, that would have been proper journalism.